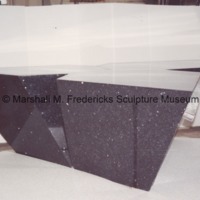 The granite base for "Star Dream Fountain"
One of Fredericks' last public works, "Star Dream Fountain" is located in Barbara Hallman Plaza in Royal Oak, Michigan. The sculpture is based on a 1947 preliminary design for the "Cleveland War Memorial". This allegorical work symbolizes man's continual search for spiritual peace.